A good-sized spider sitting in the center of its web. I missed this one completely until Chris pointed it out to me. 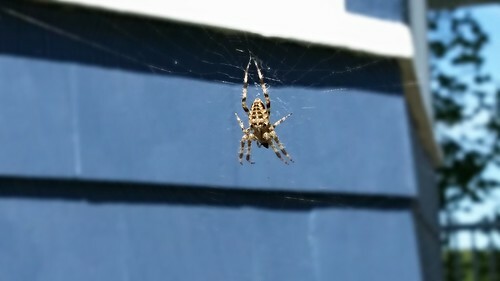 This little spider made a good size web in the front yard and was a rather larger one than I usually see. I was mesmerized with its pattern and more impressed with its size. There was a (slightly-sadistic) part of me that wanted to hang around and watch to see if a bug got caught to see how quickly the spider would spring into action. Though I guess I do have other things to fill my day, it could have been something cool to watch. I don't know why this has become "bug week" on the photo reflections but sometimes, you've got to go with what's there.